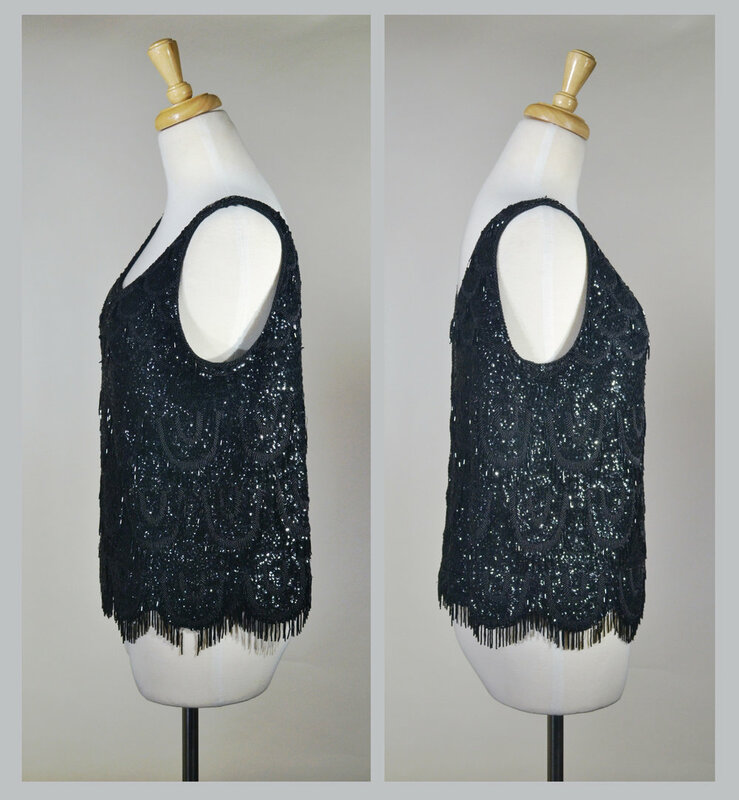 Please scroll down for images of the 1960s Sequin and Beaded Sleeveless Top in greater detail. Material: Nylon (lining), knit (body), sequin, plastic beading. Closure: Single center back metal zipper with a metal hook-and-eye closure. Like many sequin and beaded pieces that are 25+ years old, this swinging top has areas with missing sequin and beading, mostly the latter. However, outside of a few threads along the bottom beads (pictured below) there are no major "gap" areas. Overall, considering its age, this piece has held up extremely well. As mentioned above, there are a small handful of missing beads along the bottom of the top, with the most noticeable being an area near the front left and another near the back zipper (center). There are minor bits of string where beads and/or sequins are missing. These can be cut if you like and aren't too noticeable when worn. Some hand repairs were made to the lining along the clavicle and the left shoulder strap. Although she's got some heft, this baby is actually pretty darn comfortable and can be easily dressed up or down! Helpful hint: when storing your sequin pieces, turn them inside out and roll them, then place them in a drawer. This will help prevent the sequin from catching on anything and also protect the life of the garment, as hanging heavy garments tires out the fabric more quickly. Tag detail. Located on the inner right side of the center zipper. Example of small bit of exposed thread. 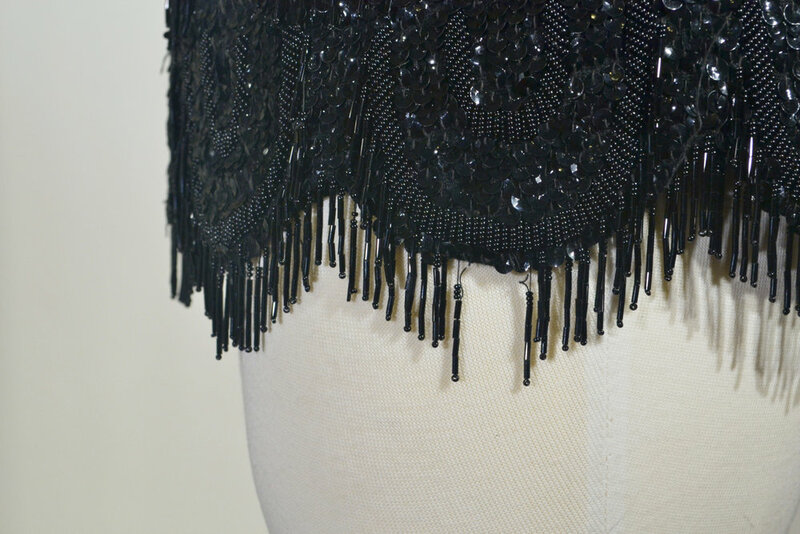 Loose sequin on the right shoulder. Loose beading and sequin along the bottom of the top. Missing beading along the bottom of the top, front left. Interested in learning about how we measure and how to measure?